We provide a wide range of treatments for men and women in our dedicated and private treatment room. Please scroll down for details or ring us on 01792 830007 for details. Our spray tans (fake tans) are available in various shades to suit your requirements. 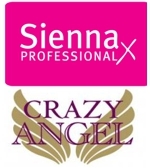 We use Sienna Professional X and Crazy Angel. We also offer a custom-made tanning service with enhancing drops to take your tan even darker! We offer pre-tan moisturisation and after tanning drying in our warm and cosy beauty treatment room with beverages of your choice and magazines. Our Spray Tanning Unit is a dedicated room for your privacy and comfort. Our spray tanning service is very popular with men and women. Spray tanning starts at just £10. Make sure you look your best with our lash and brow treatments. We offer lash and brow tines, brow tidy by tweezers and false eye lashes. We also provide threading which is a popular hair removal method used for eye brows. Threading is especially useful for defined eye brows and coarse hair. Our waxing treatments are popular with men and women. We offer a full range of waxing options to suit your needs so please ask for details. Don't forget that we also offer manicures & pedicures to ensure that you are looking your best.